Available in 16 different colors! 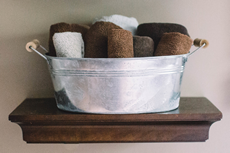 learn how to rust or age galvanized metal for a rustic finish Hot dipped galvanized steel buckets and tubs are so durable, even outside, they last for a century. Time-honored quality you can count on. Our galvanized steel pails and tubs arrive shiny and new. Click to learn how to age galvanized metal for a vintage look. 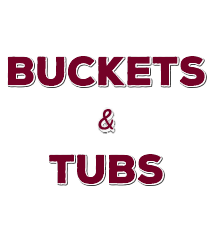 We're passionate about buckets. We like the time tested durability of galvanized metal. Available in 5 different styles! Largest selection of economical galvanized steel buckets, pails, pans, planters, troughs and tubs in dozens of tiny to huge sizes. Browse our variety of metal buckets, tin buckets, plastic buckets, enamel metal buckets, washtubs, beverage buckets, wooden handle buckets, oval galvanized tubs and more containers with a simple old fashioned style. Quick shipping from Virginia to anywhere in the USA or Canada. 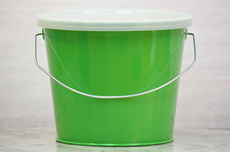 Wholesale prices for most buckets and tubs is available. Call our friendly customer service in Virginia at (800) 251-8824 M-F 8:30 am - 5:00 pm EST for details. Traditionally constructed galvanized steel work buckets are built tough and reinforced for unmatched sturdiness that is well suited for a lifetime of work and weathering on the farm or homestead. Galvanized metal silver buckets and tubs have thousands of uses, practically and aesthetically. 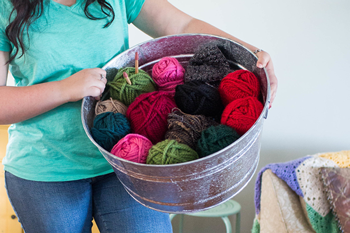 Organize, store and craft your do-it-yourself dreams with unique bucket and tub styles. Fill our sturdy and stylish buckets with candies, flowers, chocolate, letters, pictures, party favors or any small item for unique gifts and decorations. 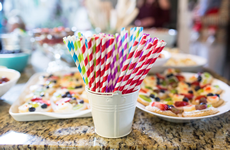 Buckets, pails and tubs are popular items for shower celebrations, graduations, sporting events, weddings, engagements, dinner parties, holidays and house warmings. 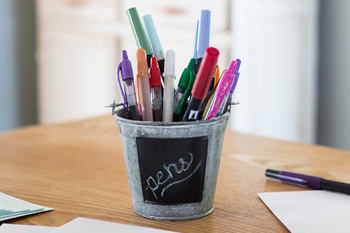 Buckets are the best table decorations because it's easy to reflect your unique style. 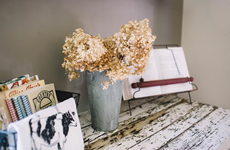 Find the country flower girl bucket or centerpiece pails for your rustic wedding day. 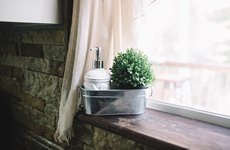 Create outdoor planters with large galvanized troughs and washtubs for inviting and fresh landscapes. 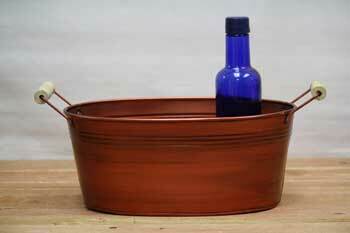 Scale down with mini pail or small bucket - they're great for crafts or projects! Beverage tub and Ice Bucket selection for outside drinks chilled on ice has never been easier.